Hoffer Flow Controls manufactures high precision turbine flowmeters, not only for the Cryogenic industry but is the world leader in turbine flowmeter technology for the measurement of clean liquids and gases throughout the processing industries. In addition, we also offer magnetic and ultrasonic style meters and electronics. 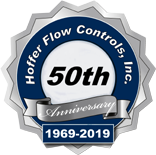 Hoffer Flow Controls maintains it position as a world leader by meeting or exceeding all the international demands for high quality manufacturing practices. Our quality system is ISO 9001 certified and we routinely handle applications that invoke various Mil-Specifications.